Governor of Poker 3 Review 2019 - Play Online Poker for Free! Start Playing Now and Get $30,000 in Free Poker Chips! Visit Governor Of Poker 3 Get $30,000 in Free Poker Chips! The Governor of Poker series was previously acclaimed as the finest offline poker game available in gaming circles, but there was one critical thing missing, a multiplayer future. Fortunately, Younda Games Holding B.V Developers are great listeners to the die-hard fans of poker. 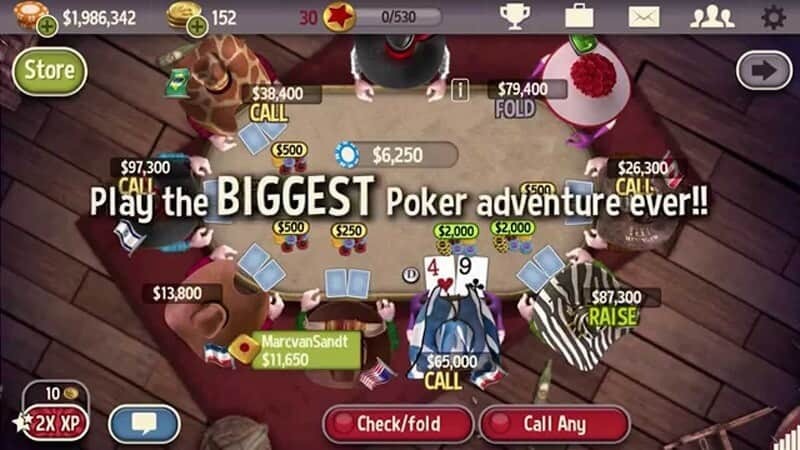 For that reason, they developed Governor of Poker 3, an exclusively multiplayer social gaming app to satisfy the competitive thirst for lovers of high stakes poker all over the world. Founded back in 2006, Younda Games Holding B.V. has been a development studio exceptionally keen on strategy game classics and multiple award winning hits that leave players glued to the screen. Governor of Poker 3, another addictive creation from them, is a social gaming combo that presents you an opportunity to take over Texas. What's more, as you crush though the classic poker games, you can involve you Facebook friends, give and receive gifts from them and make them watch you in conflicting envy and admiration as you soar through the global leaderboards. Keep reading our Governor of Poker 3 review for more details on the game. 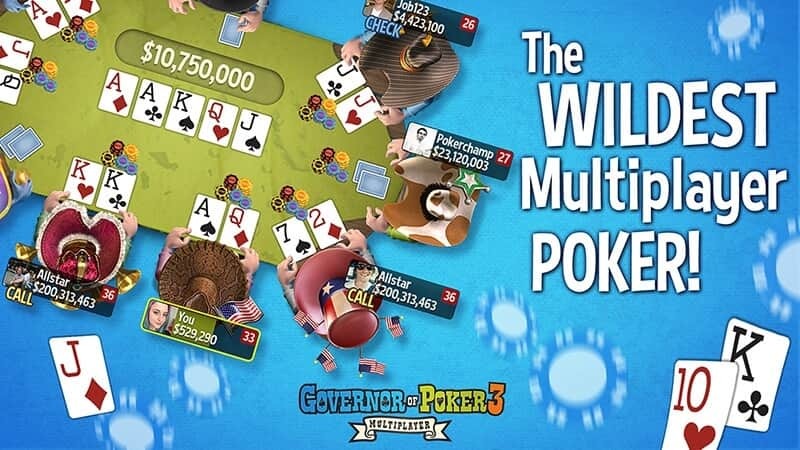 Governor of Poker 3 is a refined way to fill the multi-player gap that that was created by its single player version, Governor of Poker. Judging from what gamers are saying, the previous versions were interesting, but weren't as fun since you would play by yourself. The multiplayer version of this social gaming app solved that problem effortlessly. In addition, it brought a lot more offers to the table for those who constantly yearn for the competitive thrill of playing poker. During our Governor of Poker 3 online review, we were warmly welcomed by an exquisite interface that will light up your eyes at first glance. The game is intuitive and optimized for all types of users, whether you are a rookie or an expert poker gamer. However, if you need a little extra help, there is a quick tutorial for first timers. This will guide you in seconds to get you ready to rumble with online competitors across the globe via your Facebook details. Unlike most poker games out there, we realized in the course of this Governor of Poker 3 mobile review that you must be dressed for the occasion to play the popular poker varieties in the tournament rooms. What's even better about this is that blackjack fans haven't been left out either. There is a little something for you that is worth your while. Keep reading this Governor of Poker 3 online review and find out exactly what this social gaming site is all about. The mobile experience here is one of the best when compared to all the available social gaming apps. Navigation is easy very easy and the full site is as responsive as it can get, filling nicely on any screen size of a mobile device. In the Governor of Poker 3 mobile review that we carried out, we concluded that you don't have to download the mobile app if you don't want to. On the other hand, if you prefer using a dedicated application, then you can download the Apple or Android app. Just make sure that your Samsung Galaxy, iPhone 7, Google Nexus or Sony Xperia mobile device is up to date so that you can enjoy an optimum gaming experience. Unfortunately, users of Windows mobile, Blackberry and Amazon will have to stick to the full site. Just go to the official site of Governor of Poker 3 with your Surface Pro tablet or Kindle Fire and you can start playing right after creating your account and logging in. In our Governor of Poker 3 review, this was the most amazing part. The developers of the game start off the competitive nature of this social gaming site by making you begin as a rookie. You have to use your skill, intuition and prowess to climb up the ladder as you beat your Facebook friends. As you progress through the levels on your journey to become the King of Poker, there are lots of in-game awards, trophies and badges that will keep you motivated. You are given the chance to choose between six types of Texas Hold'em Poker tournaments namely, Spin & Play, Royal Poker, Big Win, Push or Fold, Sit & Go and Cash poker games. Unique multi-table mode: If you feel like you have some serious skills in the game or you are an advanced player, this mode is for you. In this mode, you can play poker on multiple tables or just have a few quick hands. Slow and Fast Texas Poker tables: Another remarkable feature is that you can pick your flavor. There are slow poker tables if you are a player who is more about having fun, while the turbo charged tables are for those who want to blast through the tables, beat their opponents and progress through the leaderboards as fast as possible. Poker with friends: Here, you are given an opportunity to host your specific poker rooms and then invite your friends via social media and reward them with free chips each day. For the Blackjack 21 fans, you can actively participate in blackjack games for a variety of wagering amounts and daily casino fortune deals. You have the luxury and convenience to make payments for in-app purchases using credit or debit cards such as MasterCard, Maestro, Discover Visa and Amex. Mobile wallets such as PayPal are also accepted whether you are using the full site or the mobile application. This social gaming site doesn't offer real money withdrawals, the winnings that you earn are in virtual currency. Just like any other social gaming app, Governor of Poker 3 has no real money winnings. All the earnings are in play money, which can only be redeemed for perks that will help you to advance in the stages. 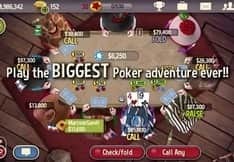 From this detailed Governor of Poker 3 online review, it is quite clear that this game is different and better than most of the other poker games you will find. You are given full control of how you want to have fun. For instance, instead of being given a huge list of poker rooms, the developers give you the opportunity to choose the type of table that you want and the pace of the game that excites you the most. If you are looking for a way to actively take part in the most popular poker room competitions, then you should look no further. There is zero risk of losing tons of money like you would in a real money online betting poker room. The thrill is equally electrifying and the games are exactly the same.